New Egyptian President Mohamed Morsi is being received as a visiting dignitary in New York this week for meetings surrounding the opening of the United Nations' General Assembly. He is scheduled to address the assembly Wednesday morning and is meeting with U.S. officials and other dignitaries. On Tuesday, as the Global Muslim Brotherhood Daily Report noted, he is to appear with former President Bill Clinton at the closing plenary of Clinton's Global Initiative conference. He was the subject of a front-page story in Sunday's New York Times, in which he claimed Egypt is not moving toward theocracy, but acknowledged being shaped by an organization that seeks a global Islamic state. "I grew up with the Muslim Brotherhood," he said in the Times interview. "I learned my principles in the Muslim Brotherhood. I learned how to love my country with the Muslim Brotherhood. I learned politics with the Brotherhood. I was a leader of the Muslim Brotherhood." "God is our goal. The Messenger is our example. The Quran is our constitution; Jihad is our way and death for the sake of God the highest aspiration." He repeated that theme during a campaign appearance last May, the Middle East Media Research Institute (MEMRI) showed, leading the crowd in chanting "The Quran is our constitution. The Prophet Muhammad is our leader. Jihad is our path. And death for the sake of Allah is our most lofty aspiration." "In face of the Jews' usurpation of Palestine, it is compulsory that the banner of Jihad be raised, it says. Elsewhere, it says "Israel will exist and will continue to exist until Islam will obliterate it, just as it obliterated others before it." Since December, Morsi has met with Hamas leaders Khaled Meshaal, Ismail Haniyeh and Mousa Abu Marzook. He also is eager to see Hamas open an office in Cairo. "Support for the Palestinian cause is a duty upon us we will discharge," Morsi said. "In fact, the Egyptian role for Gaza and Hamas after the revolution is a distinctive one." In April 2011, he "called on Arab and Islamic regimes and governments to address and stop continuing Zionist crimes against the Gaza Strip," the Brotherhood's Ikhwanonline website reported. "Dr. Morsi called for the Palestinian resistance to be supported with money, weapons and equipment to challenge this Zionist aggression, stressing that Arab regimes deal in the same way as before with the suffering of our brothers in Gaza." In 2008, he called for international aid to Gaza, which he said was needed to stop the "bloodthirsty Zionist usurper created by injustice and international terrorism." An Israeli blockade on Gaza, imposed to stop the terrorist group from importing weapons and explosives supplies for terrorist attacks, was part of "American-Zionist plots which aim to eliminate the Palestinian cause," he said. "We will sacrifice for you with our blood and our children and our money," Morsi said. "Our hands are in your hands to keep you steadfast raising the banner of the right in the first cause of the Muslims first. May God strengthen you and strengthen your backs and increase your faith. May He grant you victory over our enemy and your enemy." "We are with you," he said in a 2009 article. "May God accept you, and your deeds not leave you. God has chosen you to help His religion and defending his Aqsa, and indeed Arabism and Islam, against the herd of Zionists, descendants of apes and pigs." Like Ahmadinejad, Morsi predicted Israel's destruction. "In the end the peoples will remain and the regimes disappear sooner or later, and the usurping intruding Zionist entity will disappear with them." In a previous statement, he praised Palestinian jihad "against the Zionist American project" and said people will stand by them "by all means to liberate their land from the filth of the Zionist usurpers." The blind sheikh's case is "on my shoulders," he said during his presidential campaign. He repeated a pledge to seek Abdel Rahman's freedom the day he took office. Violent protests at the U.S. Embassy in Cairo two weeks ago likely had more to do with the Abdel Rahman case than with an online video ridiculing the Muslim prophet Muhammad. Protesters entered the embassy grounds and replaced the American flag with the black flag of Islam. 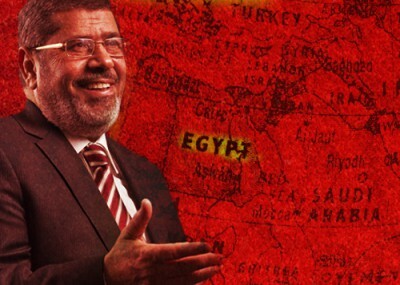 Morsi's original response was considered anemic and slow, and he called on the United States to arrest the video's producer. He may be the elected leader of Egypt, but Morsi's record demonstrates he is no statesman. He should not be treated as one.